Can you make money betting on the presidential election? The madness of crowds in the 19th century has become the wisdom of crowds in the 21st century, and nowhere is this more salient than in the online prediction markets where wagers are placed on events as diverse as natural disasters, business cycles, and, not least, presidential elections. Unlike traditional forms of gambling on the outcomes of horse races or dice, prediction markets are concerned with everyday events. You can, for instance, buy or sell contracts on whether you think the US economy is heading into a recession. Like in the stock market, the price of the contract is determined by the pool of traders who are dealing in that particular market. As far as the Democratic presidential primaries are concerned, the Intrade prediction markets indicate that traders believe Barack Obama to be the likely nominee with linked contracts trading at 85.4. Obama supporters could have literally doubled their money if they had bought Obama contracts at the beginning of February when they were trading at 35 . By contrast, Hillary Clinton contracts are going for a low 14.7, falling from 60 a month ago. If you had sold Clinton contracts 30 days ago, you could have made 4 times your money. You can think of these numbers, ranging from 0 to 100, as probabilities that traders are assigning to the chances that the candidate will win. Based on these contracts, you could say that the crowd is betting that Obama has an 85.4% chance of winning and Clinton a 14.7% chance. Over the long term, Obama contracts have steadily trending up with a dip in mid-2007, but otherwise, spiking up dramatically in recent months. Clinton contracts have traded around a long-run average of 40 with a upward bump to the high 70s coinciding with Obama's mid-2007 dip. However, that surge has subsided precipitously as the March 4 primaries in Texas and Ohio (among others) draw nearer. This level of volatility is both dangerous and an opportunity for traders looking to make quick money on the election. 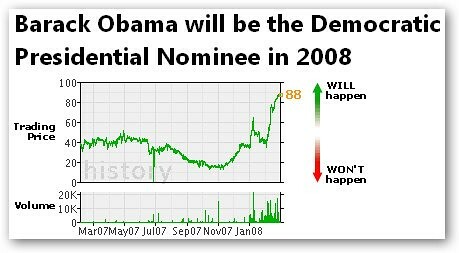 Similarly, the no-money-wagered NewsFutures' prediction market is indicating Obama has an 88% chance of winning compared to Clinton's 14%. 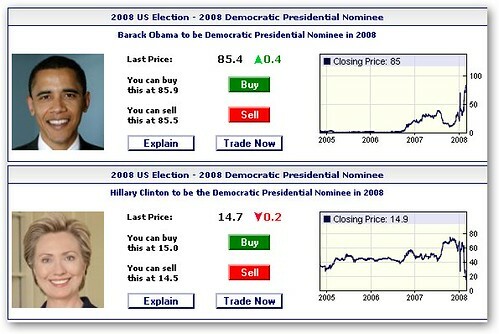 If you believe in the wisdom of crowds and the efficiency of online prediction markets at incorporating all the relevant information into the current contract prices, then yet another Web 2.0 indicator favors Obama as the likely Democratic nominee. But, perhaps more importantly, are you willing to bet on it? By the way, this article is in no way investment advice, and you are solely responsible for your investment decisions. Books 2.0: Will Widgets Help Sell More Books?